PHOENIX (AP) — Jodi Arias' effort to get the death penalty option in her murder case temporarily set aside was met Friday with a swift rejection from the Arizona Supreme Court in a one-sentence response denying the motion filed just hours earlier. However, shortly before the trial began, the prosecution changed its theory of how the killing occurred, stating that Arias first stabbed Alexander, slit his throat and in a final savage salvo, shot him in the head. Their story aimed to undercut Arias' claim of self-defense by noting the sheer brutality of the attack. Arias' attorneys claim she shot Alexander first to fend off his attack on her, but the bullet didn't stop him, forcing her to continue to fight for her life by stabbing him, which they are hoping could lead to a conviction on a lesser second-degree murder charge or even an unlikely acquittal. Contrary to Flores' testimony at the previous hearing, a medical examiner later told jurors the gunshot probably would have incapacitated Alexander. So given his extensive defense wounds, including stab marks and slashes to his hands, arms and legs, it wasn't likely the shot came first. The detective later acknowledged that he misunderstood the medical examiner in his mistaken testimony, but he never admitted committing perjury. Stephens denied the mistrial motion and testimony continued. Prosecutors declined comment Friday. Defense attorneys have not responded to a telephone message from The Associated Press. Arias, 32, has been on the witness stand for nine days, describing in painstaking detail specifics of her life in the years leading up the killing — from an abusive childhood to dead-end jobs. Yet when asked to detail events from the day she killed Alexander, Arias drew a blank, noting there were "huge gaps" in her memory from that day. She has said she only remembers shooting at him, putting a knife in the dishwasher and disposing of the gun in the desert as she drove from Arizona on her way to Utah to see a friend. And she immediately began planning an alibi "to "throw the scent off for a little while." Arias' grandparents reported a .25 caliber handgun stolen from their Northern California house about a week before the killing — the same caliber used to shoot Alexander — but Arias claims to know nothing about the burglary. She says she brought no weapons to Alexander's home on the day she killed him, again attempting to undercut the prosecution's theory of premeditation. 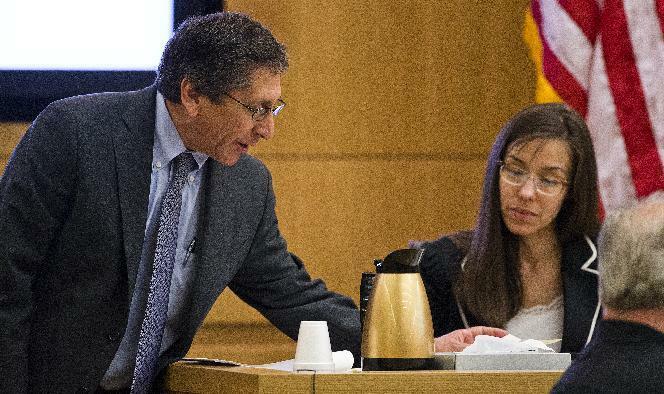 During her cross-examination Thursday, the exchanges grew so heated that the judge admonished Arias and prosecutor Juan Martinez to stop talking over each other. Arias smirked at times, while Martinez stammered in frustration. Arias first told authorities she knew nothing about Alexander's death. She later blamed it on masked intruders before eventually settling on self-defense. She now says she remembers Alexander in a rage, body slamming her and chasing her around his home. She said she grabbed a gun from his closet, and fired it as they tussled. She had no explanation for the multiple stab wounds and slit throat. However, according to court records, she previously told police before her trial began that Alexander was unconscious after she shot him, but then "crawled around and was stabbed."